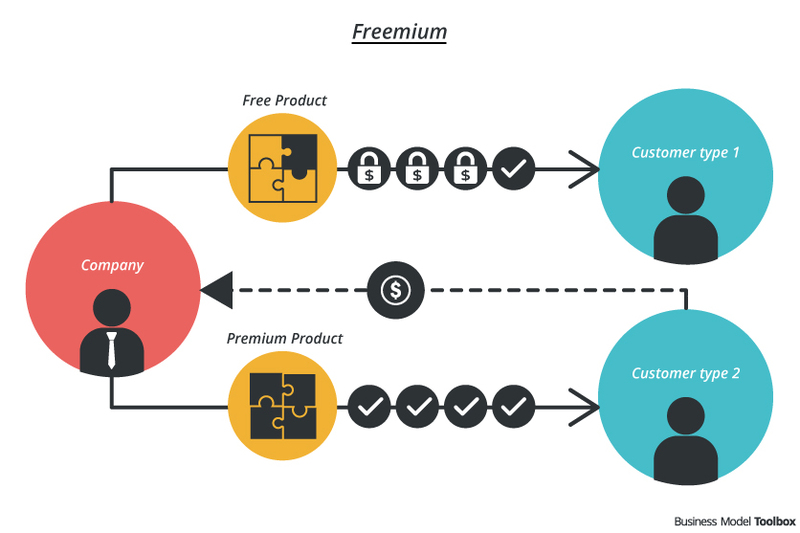 A freemium business model offers a basic service for free, additional premium functions or services are only available for a fee. The freemium business model is known as the “business model of the Internet”. The term freemium combines the words ‘Free’ and ‘Premium’. The basic product is available for free. The company generates revenue by offering connected premium product, i.e. additional functions or services which usually attract a small number of users. By giving away the basic product for free it is easier to lure users and create a customer base. This business model pattern is one of the most widely used for Internet start-ups. There are other business models that include a free product, but they are not based on the core concept of freemium. Neither the ad-financed model (link) nor the “premium with a free trial” model can be defined as freemium. Thoughtfully design the value of the free product in relation to the premium product and make both your free and your premium services desirable. Attract new customers with your free product but keep in mind what ratio between free and premium users is necessary in order to finance your business model. Free computer-to-computer video or audio calls; to be able to call mobile phones and landlines as well as to have video calls with two people and more. Platform that connects people, companies and recruiters; free to publish profile and connect to people, paid services to contact and write messages to new people or to use profile pages as a company in a more professional way; combines freemium and multi-sided platform patterns. Free storage and sharing of data; additional storage space available for a monthly fee. Free music streaming service; for a monthly fee it is possible to listen off-line and ad-free. Free newsletter service; monthly fee if you want to send a larger number of newsletters or if you want to send your newsletter to more than 2,000 subscribers; MailChimp changed their business from premium to freemium and had a huge increase in users. Large number of free users but not of paying customers: there are investments and costs involved in providing the free service, but you do not earn any money to finance it. Giving away for free a quality product that helps people can support people without or with limited means. Often a product seems free and users pay with their data (see >> Customer Data Monetization). The use of customer data to optimize your offer should respect customer privacy. Entrepreneur: Freemium: Is the Price Right for your Company?